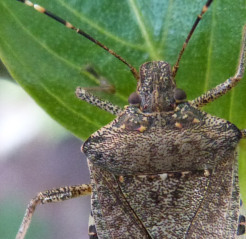 Brown Marmorated Stink Bug Update | Chatham-Kent Agriculture Development | We Grow For the World! Brown marmorated stink bug (BMSB) numbers have been down this year, although numbers trapped at our urban hot spot increased dramatically over the warm spell of the last two weeks. Almost all individuals are adults now, although we continue to find the odd late instar nymph (plus a few really early instars that won’t have enough time to complete their development). Many of these adults are looking for places to overwinter, but some are still out there in the landscape and potentially in your crop. Late season crops are at risk from feeding injury by this insect. Make sure to familiarize yourself with the pest and signs of damage. If you think you have found BMSB on your farm, contact us! Take a picture, collect some samples. Contact the Agricultural Information Contact Centre at 1-877-424-1300 or email ag.info.omafra@ontario.ca or visit our webpagewww.ontario.ca/stinkbug.